Members of Solutions, Not Punishment Collaboration rev up the crowd with their spirited chants. 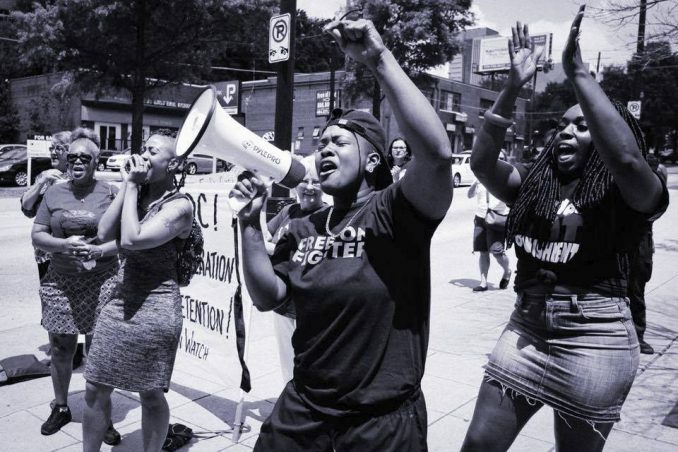 This Black, trans-led organization is engaged in several campaigns directed at ending the jailing of poor people of color at the Atlanta City Detention Center. Hundreds of immigrant detainees and many more people, often imprisoned for minor drug and “quality of life” offenses and unable to make bail, are locked up in the multistory Atlanta City Detention Center. 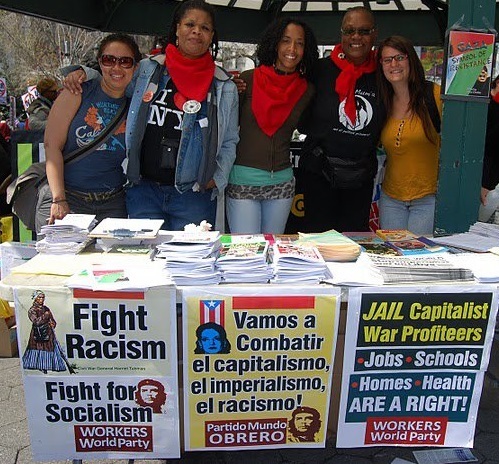 On April 21 a “Concert for the Incarcerated” was held on the plaza fronting the jail, organized by the Georgia Detention Watch and others. Singers, musicians and spoken word artists took to the mic with their messages of solidarity and personal experiences of prison. 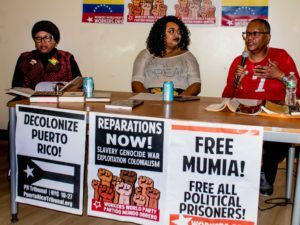 Others presented the demand that the jail be shut down since it functions as a debtor prison, a legal way to cage Black and Brown poor people. Large numbers of those held at ACDC are homeless; their poverty or mental illness is the crime for which they are jailed. The city government, led by Mayor Kasim Reed, likes to describe Atlanta as a “welcoming city” for immigrants and refugees. But the city maintains a contract with U.S. Immigration and Customs Enforcement in which it is paid to house hundreds of immigrant detainees in advance of deportation. 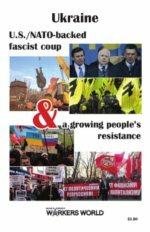 Many detainees’ only crime is driving without a license, something impossible for undocumented people to get in Georgia. Immigrant groups and their allies are demanding the end of all such contracts with ICE. From the narrow slits that serve as windows, the incarcerated men cheered and waved to the crowd below, who responded in turn. Drivers of passing cars honked in support as they read the signs and banner. A young woman described the pain of separation and the overwhelming cost of legal representation for her Nigerian fiancé, who is being held for deportation after overstaying his visa. She told of the visitation rules that allow only two 20-minute noncontact visits a week, on Wednesday and Sunday. The exorbitant cost of collect calls and a pre-paid phone account increased the couple’s separation. And tears fell as she spoke of the unrelenting fear of what was happening to him behind those walls. The Concert for the Incarcerated was a creative protest that delivered recognition for and solidarity with the humanity of those held in the ACDC — and a defiant demand to the city to shut it down.